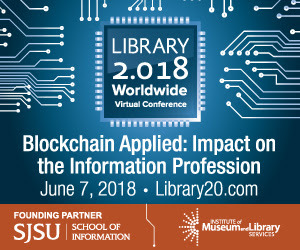 We're excited to announce our second Library 2.018 mini-conference: "Blockchain Applied: Impact on the Information Profession," which will be held online (and for free) on Thursday, June 7th, from 12:00 - 3:00 pm US-Pacific Daylight Time (click for your own time zone). 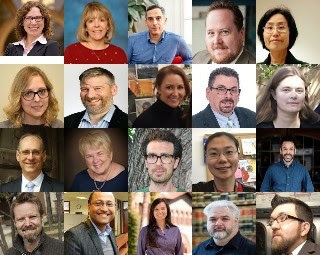 Speakers will include: Dan Blackaby, Todd A. Carpenter, Frank Cervone, Christina Cornejo, Miguel Figueroa, Patricia C. Franks, PhD, CA, CRM, IGP, Toby Greenwalt, Jason Griffey, M Ryan Hess, Amy Jiang, Stacey Johnson, Bohyun Kim, Heather A. McMorrow, Eric Meyer, Robert Norton, Tonia San Nicolas-Rocca, Ravi Singh, and Link Swanson. Blockchain technology has the potential for libraries to accomplish much more than housing electronic credentials. The technology enables a broader impact within the community and around the globe. Some suggestions being explored for blockchain applications in libraries include building an enhanced metadata center, protecting Digital First Sale rights, supporting community-based collections, and facilitating partnerships across organizations. This mini-conference will provide participants with an overview of blockchain technology and information about current applications within the information professions. Join the discussion on ways that blockchain technology can be used in libraries. https://ischoolblogs.sjsu.edu/blockchains. See below for a list of the mini-conference topics, and full descriptions at http://www.library20.com/page/blockchain. Funding for this project is made possible by a grant from the U.S. Institute of Museum and Library Services – LG-98-17-0209-17. The views, presentations, conclusions or recommendations expressed on this website or in the conference do not necessarily represent those of the Institute of Museum and Library Services.